The Jetlag Chronicles: First 48 Hours – Where in the world is Kelly? 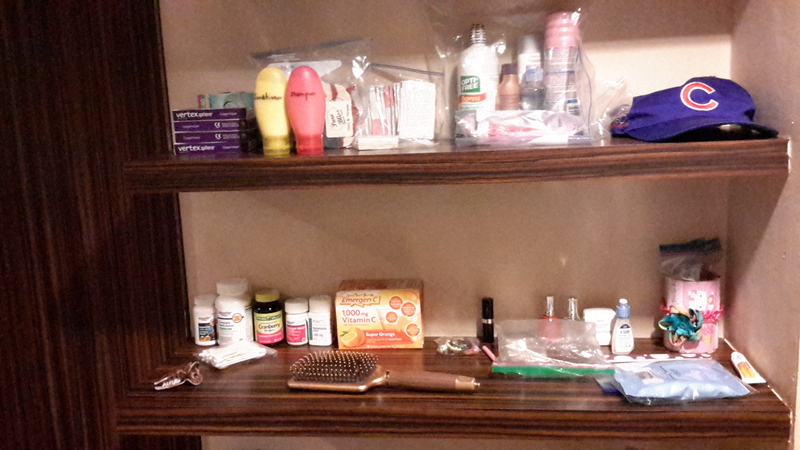 I’ve completely moved into my hotel room, unpacking all my clothes and toiletries. After all, we’ll be here for two weeks. The first 48 hours have been pretty santai [relaxed]. In Tokyo I was joined by Mackenzie, another ETA returning for a second year. Waiting to board the plane bound for Jakarta, we looked at each other with the same thought: “What are we DOING?! ?” Indonesia is not always the easiest place to live, but there are things about it that we love so here we are, back again. I even put up pictures to feel more at home. We arrived 30 minutes early, which is a good omen. Once we had our bags, we were on our way (and the following morning we were very glad we flew American Airlines and not Delta). We got to the hotel around 1:30 a.m. and the receptionist on duty greeted us warmly–AMINEF regularly puts ETAs up at this hotel when they are in Jakarta on AMINEF business and the hotel always treats us well. That morning we woke up at the surprisingly normal hour of 7:30. Despite the early start, the rest of the day was hardly eventful. I collected a box of goodies I was graciously permitted to leave in the AMINEF office over the summer. This was followed by lunch at a decent restaurant nearby and an aimless wander at a mall up the road. In our wanderings I priced phones… In the next couple of days I’ll have to bite the bullet and replace my current Indo-phone. It has become necessary to get a nicer model that can take pictures and accommodate apps such as “Go-Jek” (a motorcycle taxi service that is essential in Jakarta and my new home of Surabaya/Sidoarjo) and WhatsApp so I can communicate with the fellow SETAs. But that’s a project for later. The rest of yesterday consisted of getting Mackenzie’s bags which were stored at her friend’s house in the area, after which I indulged in a 2 hour massage at the hotel spa. It was just what the doctor ordered, and it primed me to sleep for a solid 12 hours. Dawn broke shortly after subuh this morning. 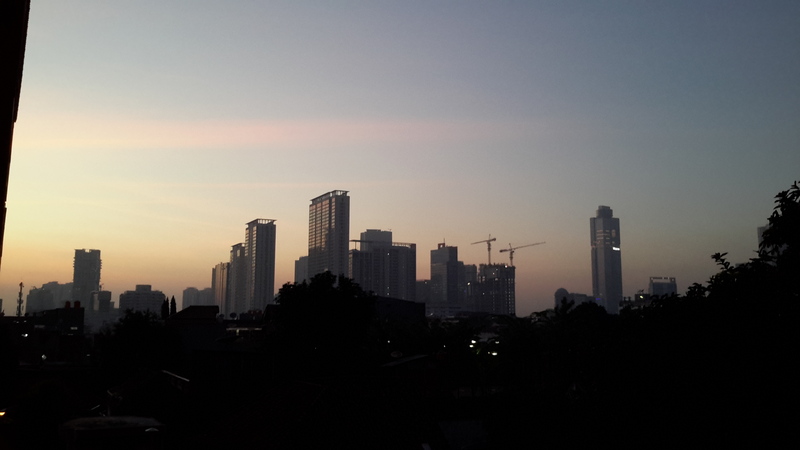 This morning, when subuh call to prayer boomed out of the soundsystem of the nearby mosque at 4:30 a.m., I was ready to get up, make coffee, and work on Indonesiaful stuff for a few hours before breakfast. During the night, Sam (the other member of the SETA Dream Team) arrived. She was ready to go early, so the three of us left for the AMINEF office together after breakfast. It was a productive but laid-back first day on the job. The purpose for us to arrive two weeks early is to plan for orientation and do whatever else needs doing to prepare for the arrival of the rest of the ETAs on August 23rd. Our office duties were interrupted a couple of times for things like singing happy birthday to Rizqi… twice. The first time we gave him a small cake doused in salt that looked like sugar, though his first bite revealed the deception. The second time we gave him a real cake, albeit a Hello Kitty one. Haha! I’d say that a salted cake paired with a Hello Kitty one is better than the shower of flour and raw eggs that are the norm on birthdays in Indonesia. One of eight postcards from Chicago that I sent to my former students. We also had the pleasure of listening to a Fulbright researcher’s end-of-grant presentation titled “Public Space in Unplanned City: Analysis of Jakarta’s Spatial Politics.” I won’t look at Jakarta’s parks and wasted space the same way again. Urban design is something that I pretty much take for granted after growing up in the Windy City. 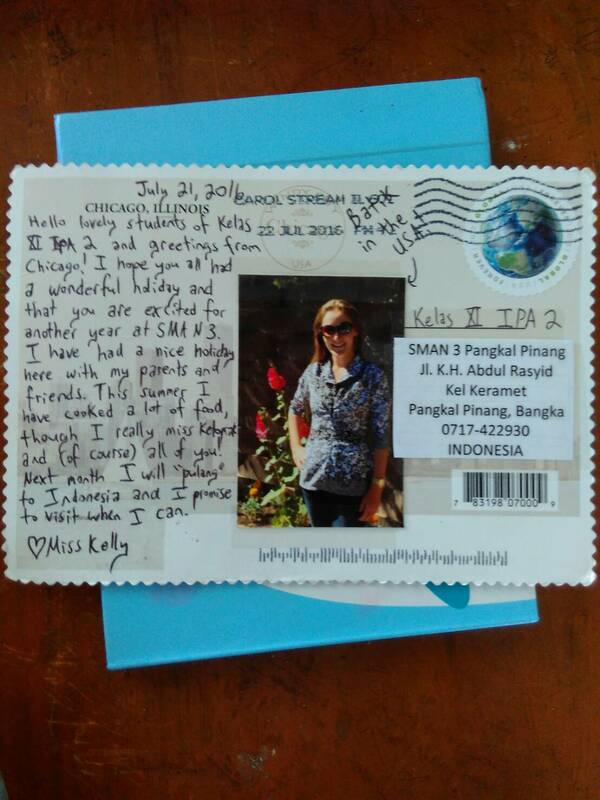 Other highlights from today included getting a text from one of my students saying that her class received the postcard I sent a couple of weeks ago. Last year at SMA 3 Pangkal Pinang, I taught 8 different tenth grade classes. My students are now in eleventh grade, so I wrote 8 postcards addressed to each of the eleventh grade classes in hopes that my former students would get one postcard per class. It seems the plan worked. The other highlight still excites me: I GOT TO SEE MY HOUSE! Last week I was told that I would be living in a house by myself this year, and today I got to see pictures. It looks charming! It has a front porch with a couple of trees and the inside looks clean and bright. I can’t wait to move in and make it my own… And of course throw some parties! My Happy Dance will continue until I move in, and hopefully long after that. Now it is almost 9 p.m., and I am definitely feeling tired. But I am showered, in A/C, and fed; in other words, content. It is good to be back, jetlag and all. Thanks Aunt Betsy! 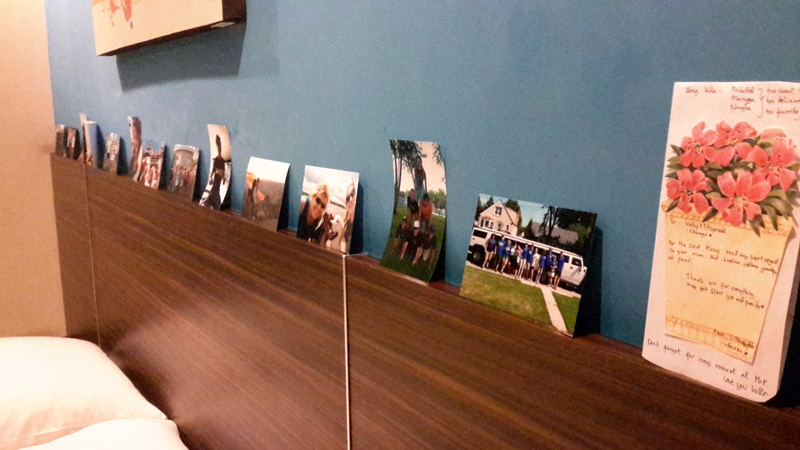 I don’t know if you could see from the picture, but photos of you and Taylor are up. Aww! Hello Kelly, so glad that you are getting comfortable. Soon you will get settled into a whole new thing. How exciting! Looking forward to your blogs on this cool new web site; Where in the world is Kelly? !